You might assume that most products arrive in the U.S. after traveling hundreds of miles in the hold of an airplane or stacked in the back of a tractor-trailer. In reality, more than half of all U.S. imports arrive by boat, a major portion sent through just five large ports located along the lower 255 miles of the Mississippi River. One of these is the Port of South Louisiana (PSL), which handled over 294 million short tons of cargo in 2016, more than any other American port. With that much trade coming in, PSL is undoubtedly a critical part of the United States’ infrastructure, making it a potential target for sabotage or terrorism. So how does Louisiana keep its biggest port safe? Enter the Maritime Security Operations Center (MSOC). Established in 2013 to expand the region’s maritime security operations, the MSOC has been a command and control center – a 2,000-square-foot concrete and steel building equipped with the latest in communications and surveillance equipment, allowing it to monitor and manage emergencies within the 54 miles of the Mississippi River under PSL’s jurisdiction. The MSOC was built with the goal of making the southern U.S. port system one of the safest in the world against both natural disasters and manmade threats. In 2013, for example, the International Chamber of Commerce’s Maritime Bureau attributed $5.4 billion in losses in the U.S. to cargo theft, and, given that PSL and the other four deep draft ports on the Lower Mississippi River handle over 510 million short tons of cargo each year, the MSOC is a necessary component in achieving this goal. Among the assets available to the MSOC are four emergency response vessels: the John James Charles, the PSV Accardo, the PSL Responder, and the most recent addition, the M/V Nathan Folse, named in honor of Nathan J. Folse, the former Executive Council for the Port. This 75-foot-long catamaran-style fireboat can pump up to 5,000 gallons per minute, and like the MSOC it serves, the M/V Nathan Folse is also outfitted with a bevy of communications equipment, including live-streaming video and real-time weather surveillance. Of course, having those assets available means nothing if they cannot be utilized effectively. 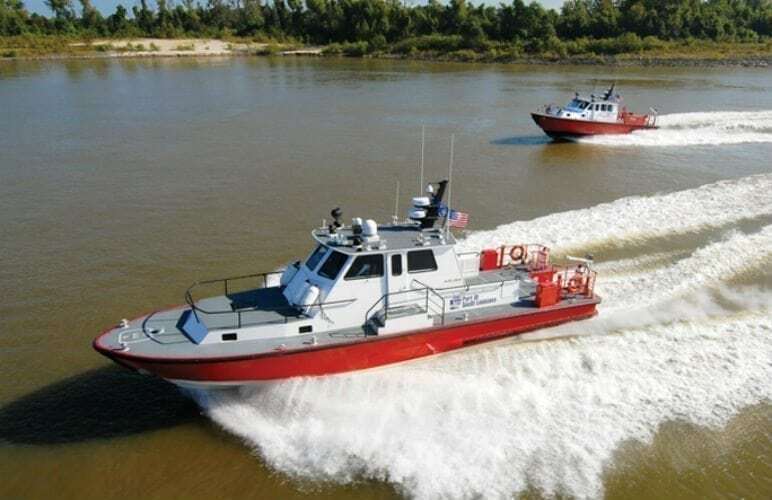 To that end, the MSOC is linked to similar stations at the four other ports on the lower Mississippi River, as well as federal, state, and local emergency response agencies. This allows it to act as a hub of sorts from which PSL personnel can coordinate quickly and easily with a variety of other responders in case of emergency. Funded in large part by grants from the U.S. Department of Homeland Security, the MSOC at the Port of South Louisiana is also a part of the ongoing effort to improve national security. Featured Image of PSV Accardo (top) & PSL Responder Courtesy of MSOC.